South Africa’s Karoo region has been in the headlines in recent years because of the prospect of a controversial fracking programme to exploit its potential shale gas resources. But, to palaeontologists, the Karoo Supergroup’s rocks hold the key to understanding the early evolutionary history of the major groups of land vertebrates – including tortoises, mammals and dinosaurs. More than 200 million years ago, South Africa formed part of the southern hinterland of Pangaea, the great single supercontinent, which was inhabited by a diverse flora and fauna. In only a few places, where conditions were conducive to their fossilisation, can palaeontologists catch a glimpse of these ancient ecosystems. The Karoo is one such place. 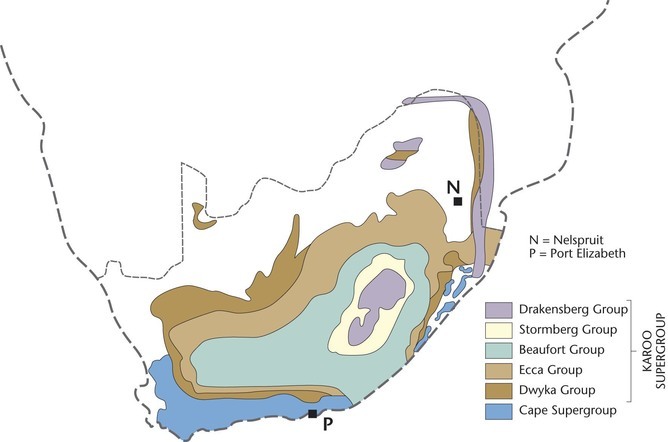 About 265 million years ago, the Beaufort Group of rocks within the Karoo sequence was beginning to be deposited by rivers draining into the shrinking inland Ecca Sea. As these rivers filled the basin with sediment they entombed the remains of land animals that lived around them. The youngest Beaufort rocks are around 240 million years old. Today, more than 30,000 fossils of vertebrate animals from the Beaufort reside in museum collections across the world. The Beaufort was followed by the Molteno and Elliot formations. The Elliot formation is made up of a succession of red rocks that records some of the earliest dinosaur communities. Map showing the formations of the Karoo Supergroup. The area plays a crucial role in revealing the distant origin of mammals, tortoises and dinosaurs. It also covers two great extinction events, the end-Permian (252 million years ago) and the end-Triassic (200 million years ago). Because of its continuity of deposition, the Karoo provides not only a historical record of biological change over this period of Earth’s history, but also a means to test theories of evolutionary processes over long periods of time. The 400,000 sq km area is internationally noted for its record of fossil therapsid “mammal-like” reptiles. These chart anatomical changes on the path to mammals from their early tetrapod forebears. The Beaufort Group has also yielded the oldest recorded fossil ancestor of living turtles and tortoises – the small, lizard-like Eunotosaurus. The younger Elliot Formation preserves a record of early dinosaurs that could help palaeontologists understand the rise of the giant sauropod dinosaurs of the Jurassic Period. Many studies are still being done on the identification of new species from the Karoo. But a lot of current research is also focused on the relationship between the extinct animals and their environments. The story of the therapsid’s burrow is a good example of how insights are being gained on the behaviour of prehistoric animals. Roger Smith was the first palaeontologist to recognise therapsid vertebrate burrows in the Karoo. He described helical burrows, which he attributed to a small species of dicynodont (two-dog tooth) therapsid called Diictodon. In the fossil record, burrows are preserved not as hollows, but as the plug of sediment that filled them. X-ray tomography at a facility in France was recently used to scan one of these burrows. 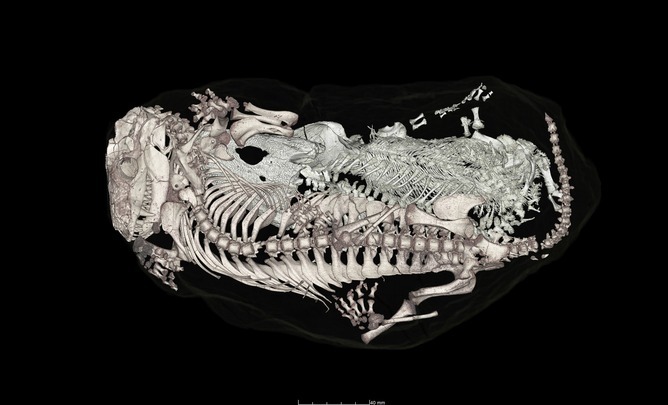 This showed that it was home not only to its maker – the meerkat-sized therapsid Thrinaxodon – but also to the early amphibian Broomistega. Further research revealed that the Thrinaxodon was probably hibernating and this is the reason why it tolerated the intruding amphibian which was using the burrow to convalesce while suffering from broken ribs. Studying how fossil bones are preserved (taphonomy) can provide similarly rich insights. For example, it has been suggested that changes in preservation style between skeletons in the latest Permian Period (about 253 million years ago) to those in the earliest Triassic Period (about 252 million years ago) can be attributed to changes in climate. The region developed from being seasonally dry floodplains with high water tables to predominantly dry floodplains. Because of the abundance of fossil tetrapods in the rocks of the Karoo Supergroup, they have been used to divide the rock succession into fossil zones, called biozones. This has enabled the biozones to be correlated with equivalent sequences elsewhere in the world and forms the basis of reconstructing global patterns of diversity. Understanding the sequence of events is crucial for testing hypotheses of evolutionary processes. It is an area of research being pursued for both the Permian and Triassic periods. The end-Permian mass extinction, the greatest, was responsible for the elimination of 90% of species living in the sea and 70% of species living on land. Roger Smith’s work on Karoo fossil vertebrates shows this extinction to have lasted approximately 300,000 years, terminating at the Permian-Triassic boundary 252 million years ago. It was followed by a lesser extinction pulse approximately 160,000 years later in the Early Triassic. Our current work is focusing on the more obscure Guadalupian extinction which occurred eight million to ten million years before the end-Permian. This is recognised from marine sequences. For the first, time empirical evidence for this event on land is being discovered from the Karoo fossil record. These are exciting times for palaeontologists. Technological and scientific developments have opened up new vistas for their work. A comprehensive database of all the Karoo fossil vertebrate collections in South Africa has been built. This is the first database of Permian-Jurassic continental vertebrates. It is available to scientists globally, an invaluable tool for biogeographic and biostratigraphic studies. Better dating techniques are opening up the possibility of working out rates of evolution in fossil tetrapod lineages. High-resolution scanning techniques are also enabling palaeoscientists to explore areas which were previously inaccessible, or at least not without damaging the fossils. There are a myriad questions that remain unanswered. 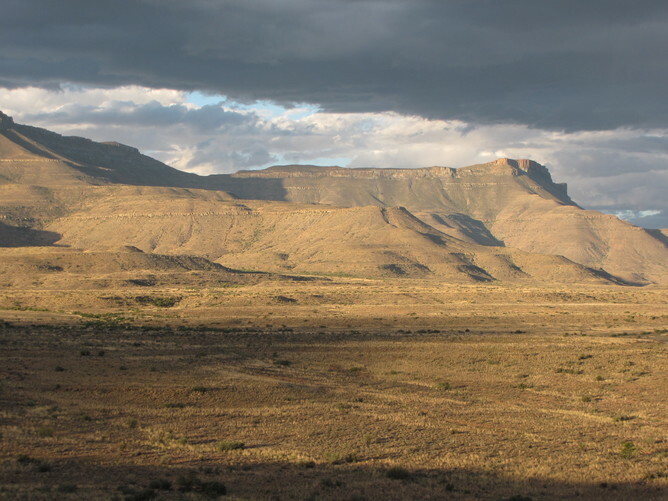 Were the early mammal ancestors of the Karoo warm-blooded? What can the Karoo tell us about the reaction of terrestrial ecosystems to mass extinction events? How can the Karoo’s shifting ecological make-up shine a light on evolutionary tempo? These are questions we can now attempt to answer. Bruce Rubidge is Director, Centre of Excellence in Palaeosciences at University of the Witwatersrand. Mike Day is Postdoctoral Fellow, Evolutionary Studies Institute at University of the Witwatersrand.